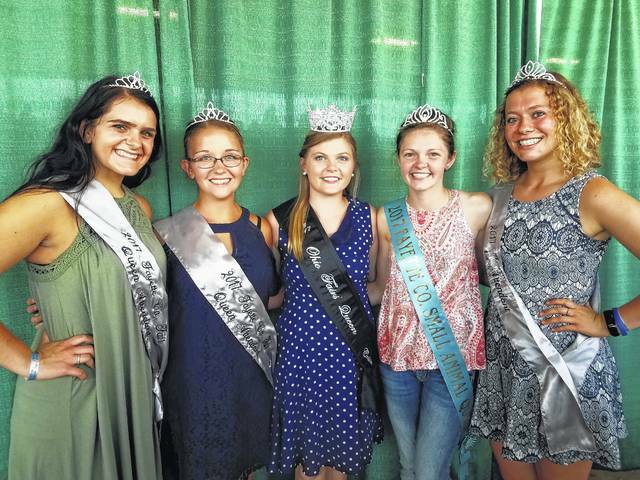 The 2017 Ohio Fairs’ Queen Crista Wortkoetter (at center) visited the 138th Fayette County Fair and met with several members of fair royalty. Check out more coverage from the fair in the upcoming Fair Review section in the Record-Herald on Wednesday, Aug. 9. Wortkoetter is pictured with (L to R): 2017 Queen Attendant Susanna Eckstein, 2017 Queen Attendant Skylynn Barden, the 2017 Small Animal Queen Abigail Riley and 2017 First Attendant Clare Sollars. https://www.recordherald.com/wp-content/uploads/sites/27/2017/08/web1_20170717_172130.jpgThe 2017 Ohio Fairs’ Queen Crista Wortkoetter (at center) visited the 138th Fayette County Fair and met with several members of fair royalty. Check out more coverage from the fair in the upcoming Fair Review section in the Record-Herald on Wednesday, Aug. 9. Wortkoetter is pictured with (L to R): 2017 Queen Attendant Susanna Eckstein, 2017 Queen Attendant Skylynn Barden, the 2017 Small Animal Queen Abigail Riley and 2017 First Attendant Clare Sollars.